The ACS Athens 2nd Annual Innovation Summit. 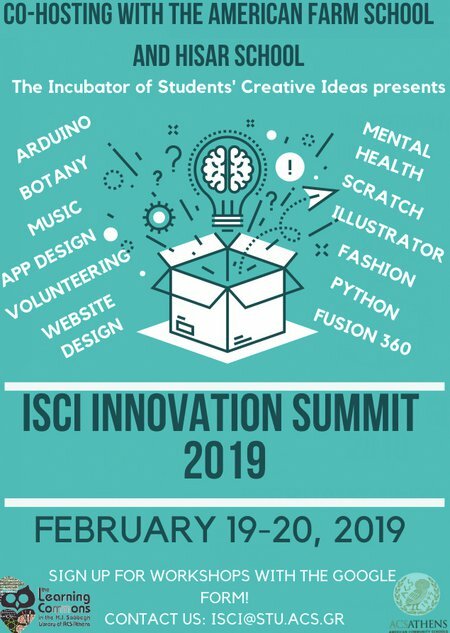 The event will occur on Tuesday and Wednesday February 19 & 20 2019 in the Hasib J Sabbagh Library, of the Learning Commons and is hosted and organized by the Incubator of Students' Creative Ideas (ISCI). The summit will include guest students from the Hisar School in Istanbul, Turkey and America Farm School of Greece (AFS) of Thessaloniki that will be presenting several computer science and other workshops to the students. ACS Athens students have also designed workshops that will be taking place during the Summit. Certificates of participation will be awarded to all participants.